Mix the garlic, brown sugar, honey, soy sauce, Worcestershire sauce, ketchup, ginger, onion powder, cinnamon, and cayenne pepper together in a bowl. Pour half the mixture into a large plastic zipper bag, and place the pork chops into the marinade. Squeeze the air out of the bag, and seal the bag. Refrigerate 4 to 8 hours, turning occasionally. Refrigerate remaining marinade in the bowl. 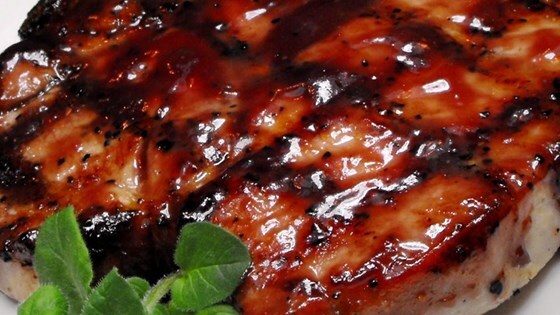 Remove the pork chops from the plastic bag, and shake excess droplets of liquid from the chops. Discard the marinade from the plastic bag. Grill chops on the preheated grill, basting with the reserved marinade until meat is browned, no longer pink inside, and shows good grill marks, 8 to 10 minutes per side. A meat thermometer inserted into the thickest part of a chop should read at least 145 degrees F (63 degrees C).